The Focke-Wulf Ta 152 was a World War II German high-altitude fighter-interceptor. 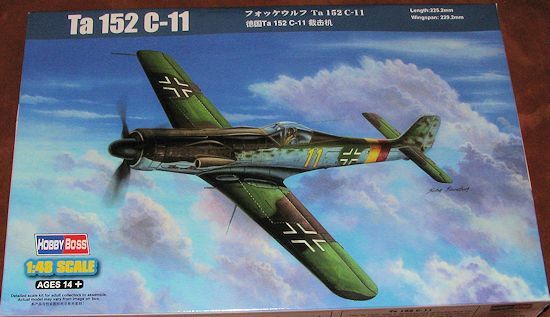 The Ta 152 was a development of the Focke-Wulf Fw 190 aircraft, but the prefix was changed from "Fw" to "Ta" to recognize the contributions of Kurt Tank who headed the design team. The number 152 was chosen in the German air ministry's list of numbers allocated to German aircraft companies, and was not related to the designer's previous projects or achievements. It was intended to be made in at least three versions—the Ta 152H Höhenjäger ("high-altitude fighter"), the Ta 152C designed for slightly lower-altitude operations and ground-attack using a different engine and smaller wing, and the Ta 152E fighter-reconnaissance aircraft with the engine of the H model and the wing of the C model. The first Ta 152H entered service with the Luftwaffe in January 1945. While total production—including prototypes and pre-production aircraft—has been incorrectly estimated in one source at approximately 220 units, only some 43 production aircraft were ever delivered before the end of the European conflict. These were too few to allow the Ta 152 to make a significant impact on the air war. I have been unable to find much at all about the C-11 variant. What tiny amount I did find claimed that it was to be a torpedo carrying version similar to a FW-190D version but I wouldn't bank on this info. I do know that it was not equipped with outer wing guns. Late info: A reader tells me that the C-11 was supposed to be a medium altitude recce version. The kit does not have the camera windows so those will need to be added in the appropriate position. I would guess they'd be the same place as for any other FW 190 recce bird. This is not the first injected styrene Ta-152C to be produced in 1/48 scale. In the late 1980s or early 1990s, Trimaster released one that had a resin wing. It was both expensive and the resin was not very good as the fit was terrible according to those who built one. This same kit but without the photo etch and resin bits was released later by DML and yet again by Dragon. This is the third Ta-152C variant to be done and is identical to the initial boxing with the exception of having a new lower wing sprue. The molding on this one is exactly what one would expect from a current Hobby Boss kit. Crisp and clean engraved panel lines along with none of the depressed rivet detail that infuriates some modelers. The kit has a well appointed cockpit with raised detailing and decals for the instrument panels and consoles. Part of the photo etch fret (most of it actually) is used for belts, rudder pedals and the like. The area behind the cockpit also gets a photo etched piece and there are a couple of p.e. antennas. A two piece canopy allows interior detailing to be viewed. 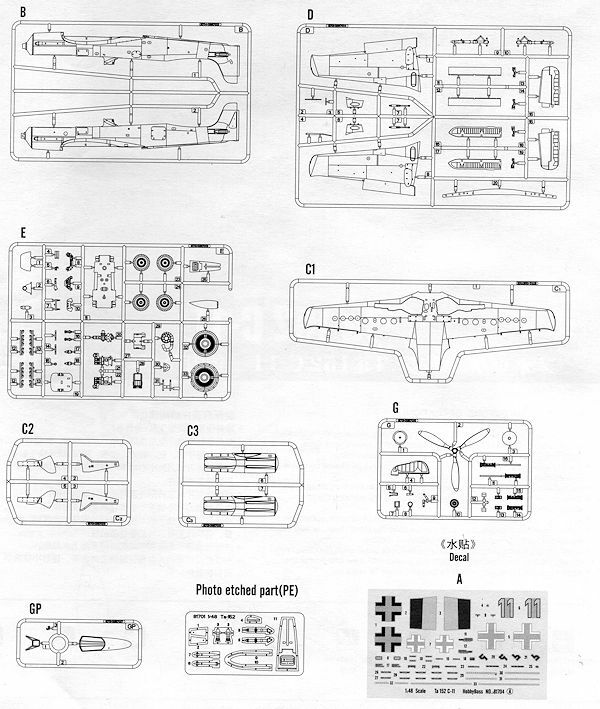 This kit includes an open accessory section that can be viewed through the wheel wells, just like on the real plane. There are two upper engine cowlings with the lone difference being the size of the bulge next to the supercharger intake. Another option is to have open or closed cowl flaps. Separate ailerons and flaps and rudder are included and while it would have been nice to have the elevators separate as well, these are molded in the neutral position. Complete wing cannon are provided, though little will be seen when done. Finally, a bit of an oddity is that the exhaust are split into upper and lower halves. Not sure why, but there it is. 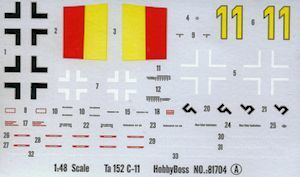 Markings are provided for one aircraft, a fictitious version with JG 301. The red and yellow fuselage bands are quite colorful and you can see why this unit was chosen. The aircraft is in RLM 81/82/76, but you can paint it any way you think would be reasonable. Hobby Boss has a full color painting and markings guide that offer colors in many brands of paints and also their RLM equivalents. Decals are very well done and my experience with them has always been positive. It is nice that HobbyBoss has decided to produce this boxing as it adds another aircraft to their very nice Ta-152C line up. 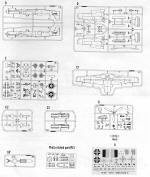 One does have to wonder how far they can take this series as all but the C-0 and perhaps C-1 were never built. Regardless of that, it is a very nice kit and will build without any issues.